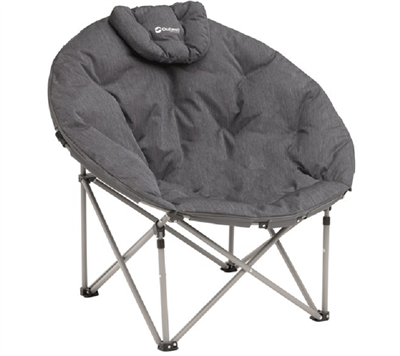 The Outwell Relax Range of light and sturdy furniture offers truly convenient designs and exceptional home-from-home comfort, combining rugged steel frames with durable,well-padded, two-tone and solid fabrics in three styles of chair, a cosy sofa for two and a hammock. New to the range are the Kentucky Lake chair with adjustable neck support and the Pinewood Lake freestanding hammock with headrest and hook and loop adjustment.Perfect for relaxing on campsites, on the beach or at home, the stable designs deliver superb comfort and support; Granada Lake has a detachable cover and all have a carrybag. Are you sitting comfortably? Get cosy with the Outwell Kentucky Lake. This soft, relaxing circle chair with thick padding offers support where needed. The detachable headrest can be adjusted to suit you and there’s a handy mesh pocket on the back for small items, like a torch. Opening in seconds with no assembly needed, it all quickly folds away when not in use into the supplied carry bag.